No, it’s not a Saturday or January 7 when I said I would be back, so don’t think you’ve gone completely mad and lost track of what day of the week it is because I wrote a blog post today. I just wanted to write a little sumthin’-sumthin’ to assuage the January 2 post-holiday blues. Here you go: The holidays aren’t over! Please don’t take down your decorations!! There are TWELVE days to Christmas, so it isn’t really over until January 6!!!!! Yep, the songs says it true. Epiphany — aka Three Kings’ Day — is January 6. So take heart! And keep up the holiday decor for another 4 days! I really don’t understand why some people must take down their trees and candles and whatnot on January 2, or even as early December 26. Especially here in New England, where winters are dark and looooooooong. Seriously, it’s dark here at 4:00. Even after January 6, most of my village keeps the candles in the windows until the spring. It just makes it a little less depressing to come home. 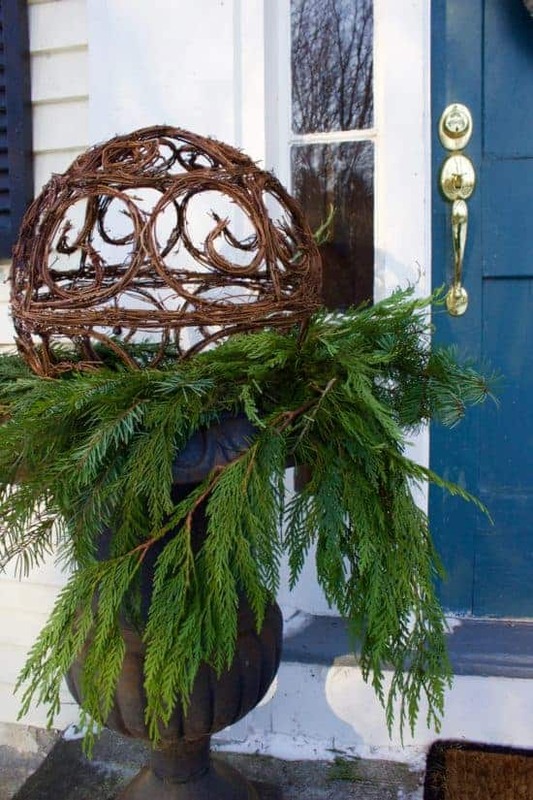 However, if you feel strangely compelled to dismantle your decorations now, I beg you …. Don’t Abandon Your Winter Front Door! 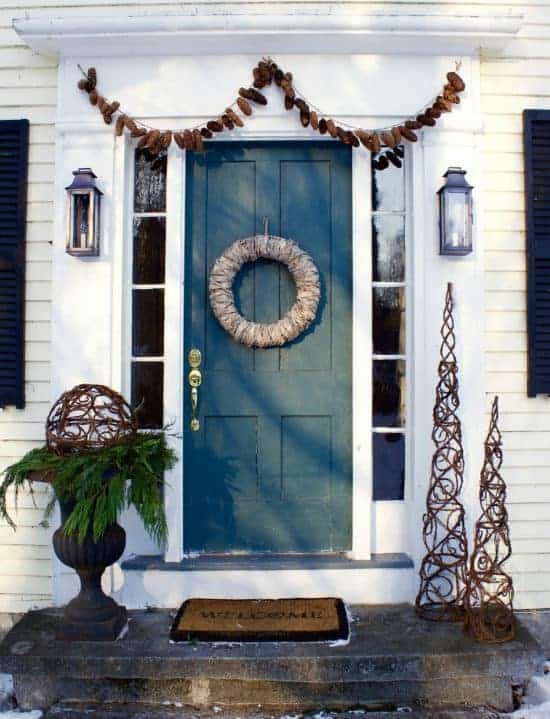 There is NO reason why your front door must look like a prison entrance just because Christmas is over. Heck, we put wreaths and flowers on our doors at every other time of the year, so why not winter?? It was 3º F when I took this picture, so please ignore the mold over the cornice. And you will have a look that will carry you through March 21. I know, I know. You’re saying, “You hypocrite! You’ve taken down your Christmas decor!” But I swear it was only for this post!! I put the red & green wreath and all my evergreen and red berry garlands back up after I took my pictures. I’ll reassemble this look on January 7, hehehe. Besides, a lot of outdoor decor stuff is on sale now. 🙂 Wanna see where I found my awesome cast iron urn? Awwww, it looks so forlorn. Kind of like Charlie Brown’s Christmas tree! “Maybe it just needs a little love” (Linus van Pelt in A Charlie Brown Christmas). My urn was 60% off at a garden store in Concord, NH called Cobblestone Design Company. And it was frozen to the ground. I went home, got a thermos full of boiling water, and poured it around the base to get it off. Just kidding. That would have been cool, though. There was another one across the yard on a stone that wasn’t frozen. I brought the non-stuck one home with me and paid for the second one in anticipation of spring and enjoying some urn symmetry. I also picked up some grapevine topiaries at Cobblestone. Now, here it is, all happy and home! 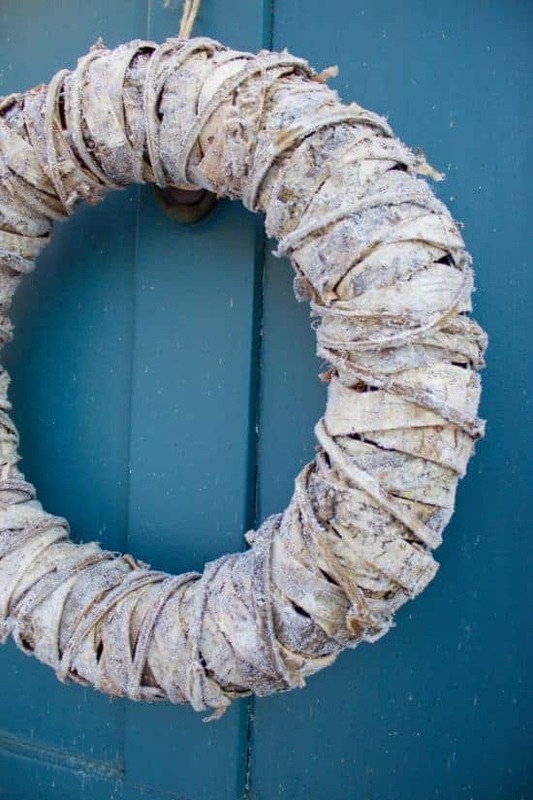 The Smith & Hawken Birch Bark Wreath is on clearance at Target right now. The pine cone garlands are only $14.95 at Bella Marie. I could have DIYed it (had I had the forethought to make one before there was 2 feet of snow on the ground), but for $30, I’d rather save myself the trouble. There you have it! A little post-holiday cheer and a welcoming entry for the long winter months ahead. I’ll be back on Saturday with a nice meaty post about one of my absolute favorite kitchens ever and ways to ensure that your kitchen renovation won’t be dated in 5 years.